Samenvatting Fundamentals of Strategie 2015 This is a summary of all the chapters from the book Fundamentals of Strategy (2015). Some images and further explanations have been added from the colleges. Fundamentals of Strategy samenvatting Samenvatting Fundamentals of Strategy, geschreven door Johnson, Whittington, Scholes, Angwin and Regnér. Boek is derde editie. Samenvatting Management Ch1-10 Appendix Detailed summary of the book "Fundamentals of Strategy" (Gerry Johnson and others), the third edition. This is the management part of the trade MST 21306. Supplemented by information from slides of the lectures. Use of images and tables. Samenvatting Fundamentals of Strategy third edition Summary of the book Fundamentals of Strategy third edition, All chapters. Concepts are also explained in Dutch through comments, which you can show or hide. Samenvatting 'Fundamentals of Strategy' Summary of the book 'Fundamentals of Strategy' for the subject of Business Administration 2 at Radboud University. The summary is of the study material. Proeftoets STRATEGY Test key for the strategy module test from year 3 of SBRM. 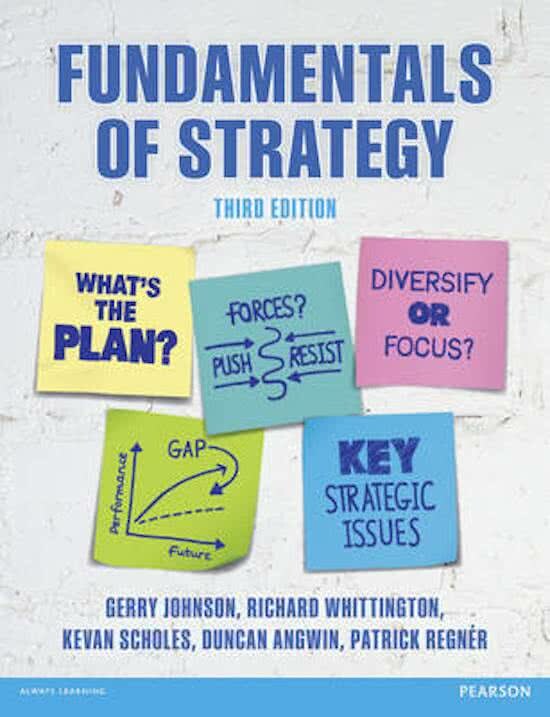 On this page you find summaries, notes, study guides and many more for the study book Fundamentals of Strategy, written by Gerry Johnson & Richard Whittington. The summaries are written by students themselves, which gives you the best possible insight into what is important to study about this book. Subjects like Gerry Johnson, Richard Whittington, MST21306, Fundamentals of Strategy, fundamentals of strategy, Management deel, Management and Marketing & Management will be dealt with.